Saint Brigid, “the Mary of the Gael,” was born around 450 in Faughart, about two miles from Dundalk in County Louth. According to Tradition, her father was a pagan named Dubthach, and her mother was Brocessa (Broiseach), one of his slaves. 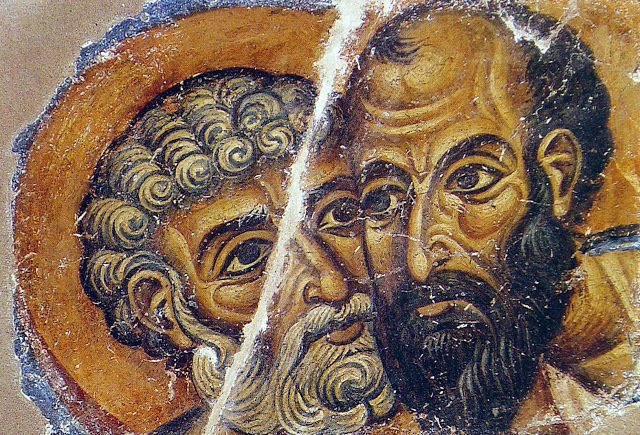 Saint Brigid received monastic tonsure at the hands of Saint Mael of Ardagh (February 6). Soon after this, she established a monastery on land given to her by the King of Leinster. The land was called Cill Dara (Kildare), or “the church of the oak.” This was the beginning of women’s cenobitic monasticism in Ireland. The miracles performed by Saint Brigid are too numerous to relate here, but perhaps one story will suffice. 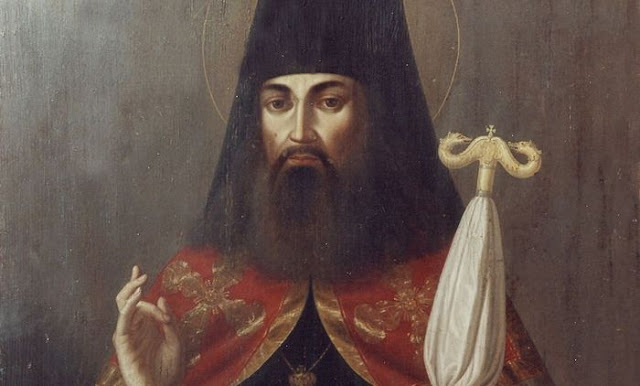 One evening the holy abbess was sitting with the blind nun Dara. From sunset to sunrise they spoke of the joys of the Kingdom of Heaven, and of the love of Christ, losing all track of time. Saint Brigid was struck by the beauty of the earth and sky in the morning light. Realizing that Sister Dara was unable to appreciate this beauty, she became very sad. Then she prayed and made the Sign of the Cross over Dara’s eyes. All at once, the blind nun’s eyes were opened and she saw the sun in the east, and the trees and flowers sparkling with dew. 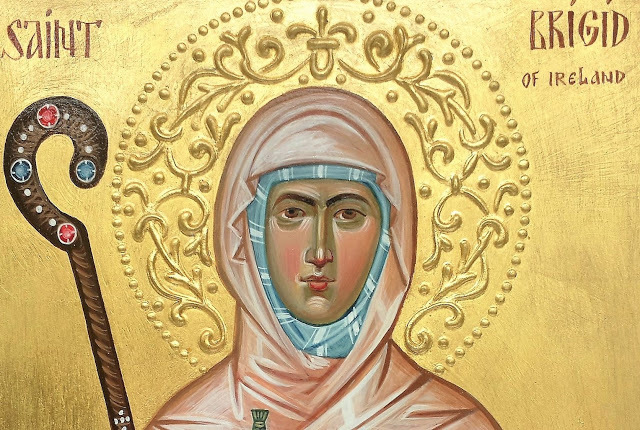 She looked for a while, then turned to Saint Brigid and said, “Close my eyes again, dear Mother, for when the world is visible to the eyes, then God is seen less clearly by the soul.” Saint Brigid prayed again, and Dara became blind once more. 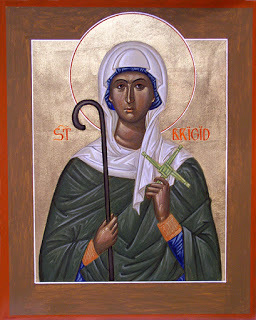 Saint Brigid fell asleep in the Lord in the year 523 after receiving Holy Communion from Saint Ninnidh of Inismacsaint (January 18). She was buried at Kildare, but her relics were transferred to Downpatrick during the Viking invasions. It is believed that she was buried in the same grave with Saint Patrick (March 17) and Saint Columba of Iona (June 9). Late in the thirteenth century, her head was brought to Portugal by three Irish knights on their way to fight in the Holy Land. They left this holy relic in the parish church of Lumiar, about three miles from Lisbon. Portions of the relic were brought back to Ireland in 1929 and placed in a new church of Saint Brigid in Dublin. The relics of Saint Brigid in Ireland were destroyed in the sixteenth century by ord Grey during the reign of Henry VIII. 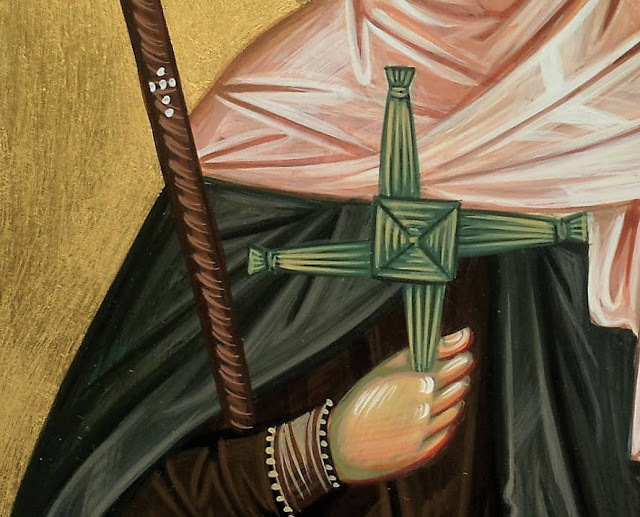 The tradition of making Saint Brigid’s crosses from rushes and hanging them in the home is still followed in Ireland, where devotion to her is still strong. She is also venerated in northern Italy, France, and Wales.